December 26 is national candy cane day. This festive candy cane cream cheese spread will put your party goers in a great mood for Christmas or even Boxing day. The spread is shaped like a candy cane but won’t stay that way long! 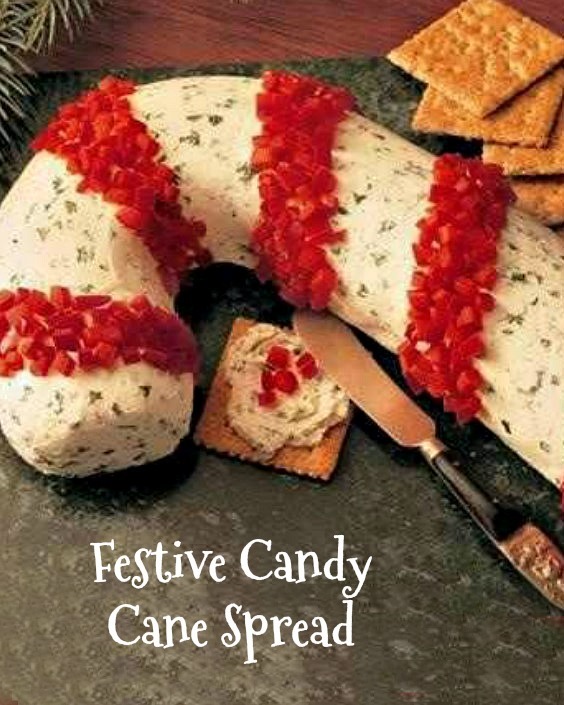 The cheese spread is flavored with a nice blend of spices and shaped like a candy cane. You’ll need several hours for it to sit in the fridge. One the log has set, decorate with some chopped red bell peppers and serve with your favorite crackers. This recipe has been shared from McCormick. Beat the cream cheese and butter in large bowl with electric mixer on medium speed until smooth. Add the remaining ingredients except for the red bell pepper; beat well. Place plastic wrap on baking sheet. Spoon the cheese mixture onto plastic wrap and form it into a candy cane shape. Fold up plastic wrap over cheese to cover it completely. Refrigerate for 4 hours or overnight or until cheese is firm. Unwrap the cheese mixture. Place it on a serving plate. Smooth the entire candy cane with spatula or knife to make it smooth. Add diced red bell pepper to form the red part of the candy cane. Serve with assorted crackers or chips. If you make this with fresh herbs, triple the amounts for best flavor.